Hmmm, Victor Robles? Requires power projection to get to 20 dingers but bat/speed combo is there for the other two. Lewis Brinson probably needs a huge BABIP year for it to happen. It seems like every eyewitness account of Anderson Espinoza starts with "scouting reports say..." and end with "but today he was erratic." At what point do results have to match the stuff? At some point they will, but don't get prospect fatigue just yet, he only turned 19 like a week and a half ago. When do minor league spring training games start? They started a week ago. Love your work, Eric. Also, thanks for chatting. I look forward to these chats. I get to know of my org (Royals) prospects and other organizations' prospects as well. Speaking of the Royals, I know you have them 3 spots apart, and there's a 5 points differential in their FV, but how close are Khalil Lee and Seulys Matias in your evaluation? They were pretty close, Lee is much more polished while Seuly is still just a giant ball of talent. Does Reggie Lawson have any sort of promise or is it all potential there? I'd argue those are synonyms but he was 91-93 with a better delivery than he had last summer when I saw him last week. I like him. As a rising senior I thought he had a chance to go in the top 15 but a delivery tweak and injury the following spring derailed him. Thought he might get to ASU. From a scout's perspective: why do you think guys like Michael Martinez get ABs/Innings over younger guys with at least some potential for upside? Defensive competence at multiple positions. Have you seen any Brewers prospects this spring that have piqued your interest in some way or another? Have not seen them yet this spring but I think today I shall. 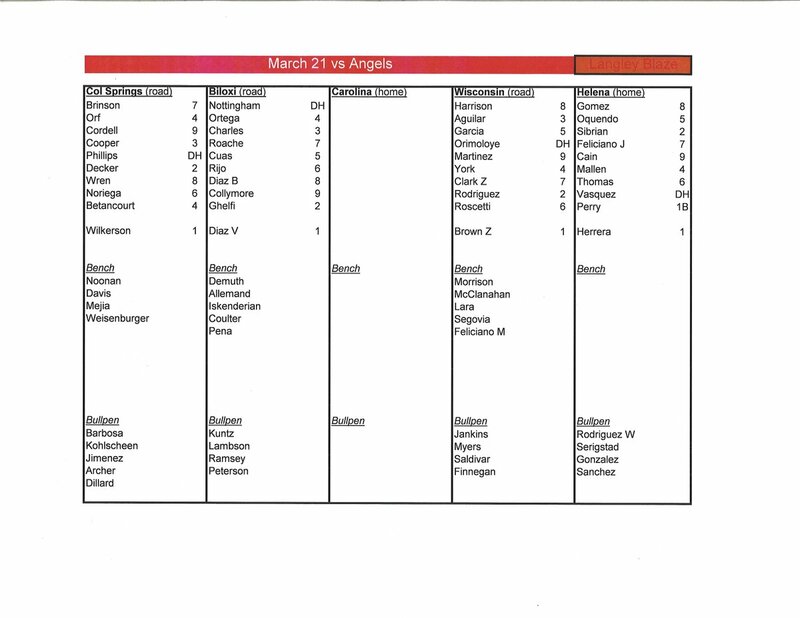 Lineups for today's afternoon games at Angels complex and home game vs Langley Blaze. So Brandon McIlwain is transferring again. He has hardly played baseball the last two years but is he still a legitimate first round talent? Man, when I saw him in HS I thought he was a top 20 pick just on tools. Clearly had very little baseball feel but there were some Delmon Young-ish traits. Natural oppo power, similar body, better athlete. I hope things work out for the kid. Reynaldo Lopez looked amazing yesterday, and I'm not talking about results. I'm talking about a disgusting change to go with his already plus other pitches. If he masters that change what's the outlook going forward? Are there any knuckleballer prospects? Why is so much weight given to Arizona Fall League performance? With so many players at less than 100% it's a good sign to see performance, but lack of performance seems to get punished despite extenuating circumstances. I get that it's a great way to see many good players at once, but it seems to bear too much weight, currently. Teams send large staffs here for a reason, but I agree that context is important. And performance isn't what we're looking for, it's tools. any chance on catching grapefruit minors? Any word on Rogers or other Astro up and comers? I'm enamored with Rogers' glove. Also a huge Gilberto Celestino fan. Why didn't you rank Sixto Sanchez 6th in the Phillies list? I know, I was bummed about it too. But what I heard was too good not to bump him up. An agent showed me video of him this spring and that fastball is nasty. Late ride to it. A 45 FV was placed on Koda Glover just a few weeks ago in your Nats writeup, has his performance since changed your view at all or is the spring sample too small and irrelevant? That's a setup/closer type grade. Most relievers are 40s, maybe a few dozen are more than that. Is Jeimer Candelario the Rodney Dangerfield of prospects? Osvaldo Hernandez thoughts? 45 FV? Gotta go see him yet, sorry guys. What happened to Bubba Starling. He was supposed to be Mike Trout before Mike Trout.